Winding down my visit to Chicago for the Cultural Studies Association Annual Meeting, where I was on a plenary on political affect with Lauren Berlant and Patricia Clough, company in which I felt truly humbled. I spoke on Lady Gaga‘s political activism, which I will speak on again next week at Cornell U. Before then I will have to take into account the fallout over her latest single “Born This Way” in Malaysia, where some deejays have been censoring the gay affirmative lyrics. Odd that Malaysia is also where Adam Lambert had to clean up his act a little on his recent international tour. While I should be (and am) upset by this censorship of gay content, I am equally interested in Malaysia’s apparent appetite for sexual risqué musical content, despite the putative restrictive codes of its moral gatekeepers. I’d like to know more about queer culture and pop culture there than I currently do. My two new articles are out, and both are on music, blackness, and queerness. Links below to full PDFs. 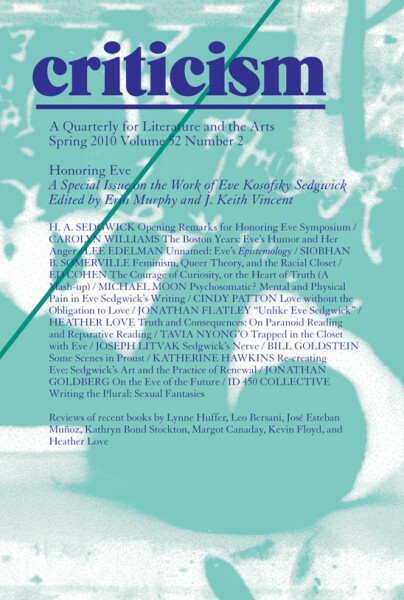 The first is my contribution to a special issue of Criticism on Eve Kosofsky Sedgwick, edited by Erin Murphy and J. Keith Vincent. My article, “Trapped in the Closet with Eve,” employs Sedgwick’s thinking about paranoid and reparative readings to interpret the Trapped in the Closet series of videos by R. Kelly. My other new article is from the special issue of the Journal of Popular Music Studies (congratulations to new editors Gustavus Stadler and Karen Tongson) on Michael Jackson (congratulations to special issue editors Tamara Roberts and Brandi Catanese). My article, “Have You Seen His Childhood? Song, Screen, and the Queer Culture of the Child in Michael Jackson’s Music” looks at cinematic and musical figurations of lateral childhood in Michael Jackson’s short films. I have to say that with both essays I feel privileged to be in such fine company. Too many to mention but I must not I found Tamara Roberts contribution to JPMS and Cindy Patton‘s essay in Criticism to be particularly rewarding. Well worth seeking out.